N)# New witloof heads on “used” chicory roots? U)# Taking chicory plants out of the garden in the winter. V)# Forcing witloof with earth coverage (in flower pot). Chicory is a winter veggie. You can harvest “witlof” when snow falls. In spring (May), chicory seed is sown in the garden soil. The seeds will germinate and big chicory plants will grow in the garden. A full-grown plant has big oblong green leaves and a gray/brown coloured root. In autumn (September to November) plants are taken out of the soil. Greatest part of the green leaves is cut off until about 1.5 inch above the root. On the photo above you see chicory plants with long roots and cut leaves, so called “chicory roots”. At “normal species” of chicory, the chicory roots are put in a shallow pit in the garden soil. Some earth is strewn between the chicory roots. Then a layer of garden earth or straw is put over the chicory roots. Layer thickness is about 6 to 8 inch. On each root there grows a small head. The heads are white/light yellow because they grow in the dark. The leaves grow in a head form due to the pressure of the straw or the earth above them. This method is called “growing with earth coverage“. At special chicory species, there is no need for a thick layer of straw or earth during growing. The chicory roots are put in big flowerpots with garden soil or compost in it. The pots are placed in the dark. On each root, a small white (or light yellow) head grows “just in the air”. This method is called “growing without earth coverage“. Growing chicory without earth coverage is the most simple method and is described in this post. In the light, loose green leaves grow on chicory roots. The leaves form a group but no head. I use this species of chicory (without earth coverage). At the back side of the sachet, the species name “Videna” has been printed. The (English) tekst “for forcing” means no earth coverage. I also used 2 other species “without earth coverage”: Zoom F1 and Focus F1. The seeds of all 3 species resulted in healty chicory plants. Good, big witloof heads grew on the roots. More info about chicory seed in tip 40) Info on a seed package . On the internet there is much info about about chicory forcing, for example this site . Mid spring (May) is the right period to sow chicory in the garden soil. When sowing earlier, you won’t get bigger plants. Sowing later do result in smaller plants. Chicory grows well in soil with little humus. So use a part of your garden that contains little or no manure or compost. The earth must be loose to get straight roots. Spaded soil is okay. Put a string or elastic band above the garden soil so you can sow in a straight line. Or put a nylon string with knots (every 10 or 15 centimeters, 4 or 6 inch) above the soil. More info about this string in tip 38) Sowing groups of seeds . Use a scoop to loose the soil deeply under the string. Push the scoop in the soil, move it aside (wiggle) to loosen the soil, pull it out of the soil, push it in the soil a few inches further, etcetera. Make a shallow furrow in the garden soil, under string. You can use a “furrow board” or 2 margarine boxes (in each other, upside down) to do this. Make the furrow about 5 centimeters (2 inch) deep and 8 centimeters (3 inch) wide. Sowing in a furrow has many advantages, such as easy watering and less drying out. And the furrow indicates the sowing spot or the sowing line. Remove the string or elastic band so it will not get wet during watering. Or carefully water the soil next to the string or elastic band. Hold the shower of the watering can close to the soil during watering. Watering like this prevents the garden soil from clogging. Let the water drop into the soil before sowing. Chicory plants are big and need much room to grow. You better sow chicory seeds in groups. Each group contains about 10 chicory seeds. Between the groups there is about 15 centimeters (6 inch). Later on, remove small chicory plants until there is 1 chicory plant per group. In each group, this remaining plant grows into a big chicory plant. You can put a nylon string (with knots each 4 or 6 inch) next to the furrow. Use the knots in this string to sow the groups of seeds at fixed distances. More info about this string in tip 38) Sowing groups of seeds . Or use a lath or stick or folding ruler to indicate the sowing spots. Or sow the seeds by hand at more or less fixed distances. Strew some chicory seeds in a white tray so seeds are clearly visible. Or strew chicory seeds on (in) one hand. Each time grab a few chicory seeds between thumb and index finger out of the tray or your (other) hand. Lay or strew about 10 seeds one after another in a row or in a group on the bottom of the furrow. Lay the seeds “across the furrow”. So from one long side of the furrow towards the other long side of the furrow. Strew one group or one row of seeds each 15 centimeters (6 inch). When you use a string with knots each 10 centimeters (4 inch), sow “near a knot” and “between 2 knots” alternately. This results in a distance of 15 centimeters (6 inch) between the groups. On the sachet, 10 centimeters (4 inch) distance between the plants is recommended. But 15 centimeters (6 inch) is better. At a distance of 15 centimeters (6 inch) there is less risk of big plants having some rotting outer green leaves. Strew some moist finely crushed garden earth on the seeds in the furrow. Layer thickness about 1/4 inch. You can fill a small plastic flower pot with a little moist earth and strew the earth through the bottom holes of the pot. It is good to cover the furrow with pieces of corrugated plate or a band of fabric. This prevents seeds from drying out at dry weather or from washing away during heavy showers. Remove this covering when first chicory plants are above the soil. Wait until chicory plants are shot up. When plants in the furrow are about 5 centimeters (2 inch) high, thin out until per group 2 chicory plants are left. When possible 2 plants that are “far apart”. That’s better at the next thinning out. Water the plants after thinning. After some weeks, pull out smallest plant of each pair. So one plant, the biggest one, remains in the soil. Water the plant after thinning. When there is only one plant shot up in a group, thinning is not necessary, of course. It can happen that no plants have been shot up. Or accidently you pulled out all plants during thinning out. Or a mole has undermined the furrow and many seeds or plants are gone. Sow extra chicory plants on a small plant bed somewhere else in the garden soil. Or use the plants in the furrow after first thinning; at each group of 2 plants, you can transplant 1 plant. Spray the plants before transplanting. Take each plant with a moist root ball out of the garden soil and replant it at an empty spot in the furrow. Then spray the plants in the furrow. Chicory is an easy plant. Each week, hoe between the furrows and weed in the furrow between the (small) plants. When plants are big, hoeing and weeding is not needed anymore. Only pull out big weed plants. Water small Chicory plants now and then. Water big plants at long droughts. End of summer (August). Two rows with big chicory plants. When plants are large, few weeds will grow between them. Thanks to the long root, the plant will not dry out so easy . The big leaves prevent the soil from drying out too fast. Only water the big plants at long droughts. End of summer (August). Between the plants these kind of leaves are on the soil. That is okay. From early autumn (September) on, you can take the plants out of the soil. Use a spade or a fork. In early autumn you can take the plants out of the garden soil and have them laying on the ground or the garden soil for about 5 to 10 days. During this time, nutrients will go from the leaves to the root (I read somewhere on the internet). Lay the plants in a single, a double or a triple row on the ground. Lay foliage of the next plant on the roots of previous plant to protect the roots from drying out by sun heat. You will end with “bare”roots. Lay a plastic tray or wooden board or something like that on these roots. From mid autumn (October) on, you can take the plants out of the soil and take them home immediately for further processing. The plants do not have to lay on the soil for some days then. Spread the witloof harvest by frequently digging out the plants between early autumn and early winter. Put the digged roots in flower pots with compost. At each Chicory plant remove the outer leaves and cut a big part of the foliage. At each Chicory plant with a (too) long root, cut the root shorter. After this, you end up with Chicory plants that look like the ones on the photo above (in the washing-up bowl). Put the “treated” Chicory plants (Chicory roots) in a flower pot filled with compost. On each Chicory root, a witloof head can grow in the dark. (Attention: these roots are not the same roots as 1 photo back). At each Chicory plant, you better remove the outer (short) leaves before growing witloof. The witloof head grows from the inner leaves on the Chicory root. The outer short leaves dry up and get brown during the growth of witloof. Sometimes these outer leaves rot and smell bad. … or first break off outer big green leaves. Then shorten the remaining inner leaves. Below there is a description of method 1 (shorten all leaves, then break off outer leaves). Further on in chapter G1), there is a description of method 2 (break off long outer leaves, then shorten the leaves). A plastic flower pot of about 10 to 12 inch high (edge to bottom) is suitable for forcing. At each chicory plant, a part of the root and a big part of the foliage is cut before putting in compost. Cutting leaves and root(s) goes well when the chicory plant lays on a wooden board during cutting. Use a sharp knife to cut a part from the root. After cutting, the length of the root is (approx.) equal to the height of the pot. Use a sharp knife to shorten the foliage until 4 to 5 centimeters (1.5 to 2 inch) is left on the root. Attention: Do not cut the foliage too short. At some species you can cut away all inner leaves then. The growing point of the root has been removed then. No big witloof head can grow on such a Chicory root. Somewhat further in this post there are photos of Chicory roots with removed outer leaves. These photos show longer and shorter leaves growing on the root. Some roots of chicory plants are “multiple” or very short. Then act as follows. Multiple roots: Cut all long roots to the desired length. When there are also short thin roots, cut them near the thick part of the root. Short roots with long, thin multiple roots: Cut away a big part of the thin multiple roots. When there are also short thin roots, cut them near the thick part of the root. On these photos a part of a chicory plant that is forming a flower stem. So there are no leaves in the middle. On this root, no head will grow. You can’t use this root. After cutting the foliage, brown, withered, or “a little rotten” leaves can be visible. See photos below. At this chicory root, all brown short leaves can be broken off (more about this in chapter G)# of this tip). Then a good witloof head can grow on that root. This root has many brown short leaves, also near the centre. At this root there is a big risk of a rotten witloof head growing on it. At a root with rotten leaves, you have to break off many leaves. Next step is cleaning the root with a soft brush under running tap water. This is a rotten root after ‘cleaning’. Most of the time a normal witloof head will grow on it. When the root and/or leaves are “very rotten”, do not use the root for growing a chicory head on. Or cut away a part of the root (and leaves) until cut surface is clean. On this root many small heads will grow. These heads grow much slower than “normal”chicory heads. Heads look like the ones at N)# Test with “used” chicory roots. On this photo you see the top of cut foliage in close up. After cutting, white liquid is dripping from the leaves. That’s normal. Further in this post you read that a chicory head grows on the middle of the root. The chicory head grows from the central short leaves. The outer short leaves dry or can rot and cause bad chicory heads. After cutting off the foliage, you better remove many short leaves, starting from the outer side. At this root, foliage has been cut. And at the same root, many short leaves have been removed (from the outher side). The leaves in the center of the root are shorter than the leaves at the outer side. In the middle, the leaves are growing on a higher part of the root, on a small hill. That’s why you should not cut foliage “too short”. Chicory roots just after cutting the foliage. And on this photo the same roots with many outer short leaves removed. This looks better and there is less risk of rotting leaves or rotten witloof heads later. Above, there is a description of method 1; first shorten all foliage, then break off many short outer leaves from the root. But you can also first break off many big green outer leaves from the root. Then shorten the inner green leaves. This is method 2. A row of chicory plants in the garden soil. The inner green leaves are shorter than the outer green leaves. These inner leaves are the “heart” of the chicory plant. One chicory plant digged out. Break off all long outer leaves and some shorter leaves right above the top of the root. Break off more (outer) leaves. End up with a chicory plant with a few inner leaves, the heart of the plant. Use a sharp knife to cut a big part of the inner leaves. You end up with a chicory root with few short leaves. When needed, you can break off some more short outer leaves from the root. Now you can put the chicory root in a (plastic) flower pot with compost. At chicory species with a “round root top”, the inner leaves are growing higher on the root than the outer leaves. When you first cut all leaves shorter, you can end up with too short inner leaves. You can even cut in the root itself. Then you have removed the growing point of the root. On such a root there will be no big witloof head growing, but only many small heads. When you break off many long outer leaves first, you can see how high the inner leaves grow on the root. Then you can cut the inner leaves at the right length, so one big witloof head will grow on the root later. Below there are some photos of breaking off and shortening at Chicory roots with round root top. Chicory plant digged out in December (begin winter). Outer leaves have brown spots due to freezing weather. After breaking off big outer leaves and shortening inner leaves to 2.5 centimeters (1 inch), this root looks good. A good, big witloof head can grow on it. It is clearly visible that the inner leaves grow higher on the root than the outer leaves. This “half rotten” Chicory root has been digged out in December too (early winter). After breaking off outer leaves and cleaning and shortening inner leaves the root looks good. At this root, it is also clearly visible that the inner leaves grow higher on the root than the outer leaves. Both method 1 and method 2 work well. At method 2 there is less risk of “too short inner leaves”. So method 2 is somewhat better than method 1. G2) How many short leaves minimal? How many short leaves are minimal needed to grow normal witloof heads? Below an answer. In this chapter there are photos of chicory roots with short leaves. They are put in a flower pot with compost. And there are photos of the same roots with witloof heads on it. Further in this tip you can read how to put the roots in compost and how to grow the heads. 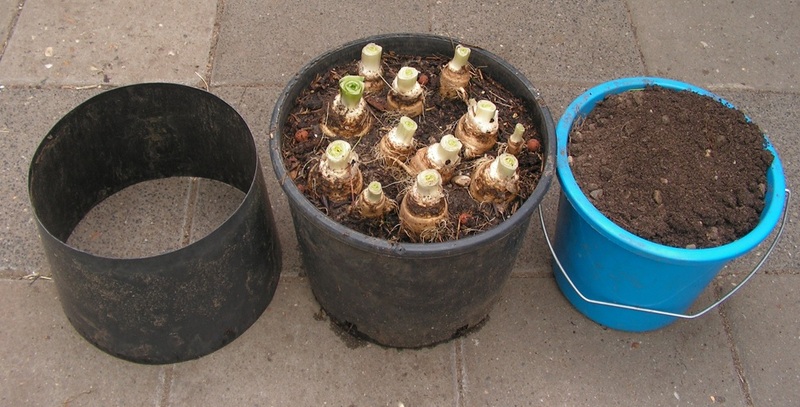 To grow witloof heads, chicory roots are put in a flower pot with compost. See photo above. Click on the photo for screen wide view. On the photo there are roots with 4 to 7 small leaves per root. And roots with 8 to 12 leaves per root. And there are roots with more leaves. At one root with many rotten leaves, a part of the top has been cut. That is the “cut root” with no short leaves. The left photo above is the same photo with roots in compost. On the right photo above the same roots with heads grown on. At the edge of the flower pot there is a groove, a mark. It is visible at both photos. Click for wide view. After taking out 3 roots, the “cut root” is clearly visible. There are only a few small heads on it. All roots with heads on. At the far left side you see the “cut root”. All 8 normal heads have approximately the same size. All roots have few or some more small brown leaves. Click for wide view. The lower part of the “cut root” has rotten in the compost. It has only 2 (3) small, tiny heads. When putting this root into the compost, there was no rotting spot visible. The harvest on the 8 normal and 1 rotting Chicory roots (from above). Total 1120 grams of witloof. Above there are 4 photos of other Chicory roots with few short leaves. Some short leaves are shorter than others. In the edge of this pot there is a deep V as mark. The left photo shows the roots after putting in compost. On the right photo you see the heads grown on the roots. Good, normal witloof heads grow on Chicory roots with few (2 to 7) or more short leaves. On roots with very short leaves, good heads grow too. All heads have about the same size. There is no big difference between roots with few, more, or even more short leaves. All heads have few or some more short brown leaves. At a “cut root”, only small heads grow on it. Put the Chicory roots in a plastic flower pot filled with compost. In the bottom of the pot there are small holes. Do not put too many roots in the flower pot, otherwise Chicory heads grow against each other and can rot. About 7 to 10 roots in a flower pot of 12 inch top diameter is okay. The compost with Chicory roots is wetted once. After this wetting, no water is added to the compost anymore (except when compost is very dry). The leaves of the Chicory roots are above the upper edge of the flower pot. The top of each root is about 1 inch above the compost. When needed, push some roots aside in the compost. So roots are not too close to each other in the flower pot. The heads that grow on these roots will not touch each other then. As a result the heads will not rot so easy. Put a layer of dry sand on the compost. Layer thickness 0.5 to 1 inch. Use garden sand, masonry sand or sandbox sand. 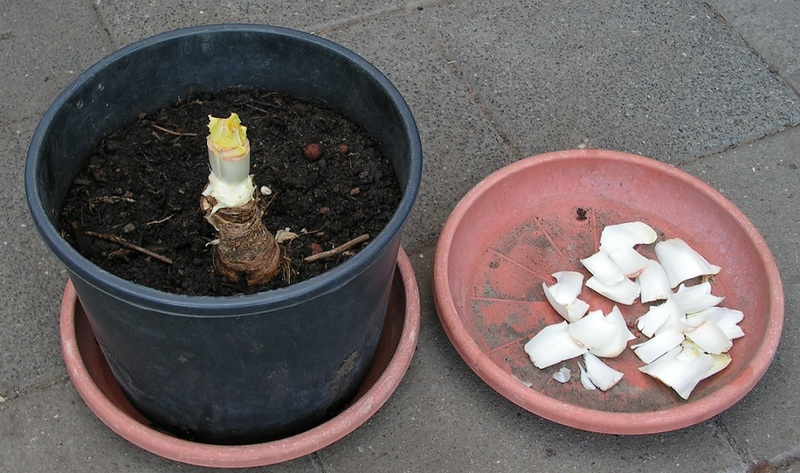 A dark cardboard cylinder is put over the flower pot with chicory roots. This cylinder has air openings. The above mentioned points provide a good air refreshment above and between the chicory roots, so little risk of rotting. Below there are photos about putting Chicory roots in a flower pot with compost. You see roots with broken off short outer leaves. Further in this tip, at Q)# there are some photos of heads grown on “roots with all short leaves on”. Most chicory plants have straight roots. Each root looks like a winter carrot, with a grey colour. It is easy to put a straight root into a round hole made in compost. Below there is a description. A chicory root with many small thin roots (multiple roots) is hard to put in a round hole in compost. You better lay this root in a slanting flower pot on a layer of compost. Then strew some compost on this root and put on another root. Etcetera. This method is described in chapter H2) Putting multiple roots in compost. Needed: Straight chicory roots, a big plastic flowerpot, a bucket with “loose”compost and a planting dibber. Put compost in the flower pot until 1 to 2 centimeter (o.5 to 1 inch) below the edge. Gently push on the top of the compost (with the bottom of another flower pot) to compress the compost a little. Make a round deep hole in the compost. Push the dibber in the compost until its point reaches the bottom of the flower pot. Wiggle the dibber in the compost to make a \ / shaped hole. Carefully pull the dibber out of the compost, so no compost will fall in the hole. Put a chicory root in the hole. Push the root down when needed. Continue putting in roots until there is no more space in the pot. Or until there are no Chicory roots left. Is a root too high in the compost, take the root out. Cut a piece of the lower side of the root. Put the root back in the compost. Is a root too deep in compost, take the root out. Put some compost in the hole. Put the root back in the compost. For thin roots, use a thin dibber or a broomstick to make the holes in compost. When needed, strew some compost between the chicory roots in the flower pot. You can use a spoon to do this. After cutting, these Chicory roots have many thin roots next to each other. You can’t put them in a round hole in compost. Lay an empty flower pot slanting on a brick or something like that. Strew some compost in the pot against the “lowest side” of the pot. Lay a chicory root with many small roots on the layer of compost. Strew compost on and between the roots. Lay new roots on the compost. Etcetera. Continue until the pot is full of compost and chicory roots. Put the flower pot upright. When needed strew some more compost between the roots. You can use a spoon to do this. Shift the roots up or down when needed. Push the roots aside a little when they are too close to each other. Lift the flower pot a few inches and drop it on the floor again. This makes the compost sink between the roots. When needed strew more compost between the roots. You can use a spoon to do this. Or first lay all multiple roots on (in) compost in a slanting pot. Fill the slanting pot with compost until full. Put the flower pot upright. Make holes in the compost and put straight roots in the holes. Fill a watering can with cold tap water. Pour or spray much cold water over and between the chicory roots. Water may flow over the short leaves. In this way short laves are rinsed clean. Move or spread the roots when desired. In the wet compost you can move the roots easily. When roots are too close to each other, chicory heads can touch each other. These witloof heads can rot or brown spots can appear on the white leaves. Let the water fall in the compost. Pour or spray water on until the compost is wet through and a lot of water has flown through the holes in the bottom of the flower pot. Wait for about 24 hours to let most water flow out of the flower pot. After the 24 hours of waiting, put the pot on a dish. This prevents water from dripping on the floor of the dark cellar or barn or garage. Later on, during witloof growth, you can pour water in this dish when the compost is too dry. The photo above shows that the “necks” of the roots are at about the same level as the edge of the pot. The heighth of the compost is about 1 inch below the edge of the pot. When the dish is too small, you can put 3 blocks (pieces of wood) in the dish and put the flower pot on these blocks. Later on, during witloof growth, you better make a small pit in the top of the compost layer (“far away from the roots”) and water the roots via this pit. Caution; don’t wet the heads or the roots during watering. This can cause rotting or brown leaves at the heads. Put a layer of dry sand (garden sand, masonry sand or sandbox sand) on the compost. Layer thickness about 1 cm (0.5 inch). This reduces rotting of the chicory heads. Dry sand forms a barrier between the wet compost and the dry witloof heads. Also less earth worms wil crawl from the compost into the chicory heads. That’s better during cutting or eating the chicory harvest. The compost and the sand in the flower pot will dry out. Most of the time there is enough water in the compost to grow big witloof heads. When the compost might be too dry, pour some water in the flowerpot dish. Or make a small hole in the sand, “far away from the roots”, and pour some water in this hole. The chicory heads must grow in the dark at about 15 C (59 F). Put the flower pot with roots in a dark place, in a cellar, cool barn or cool garage. And make a “pitch dark” area to have white heads growing. This photo shows a (too low) cardboard box over a flower pot with roots. In the edge of the box there are air openings. For a flower pot of 10 to 12 inch high, this cardboard box is too low. You need a high narrow box. Such a box is hard to find. You better make another dark space as described below. For this dark space you need another big (black) plastic flower pot and a (black) plastic dish. Put the second flower pot upside down on the flower pot with roots. Lay the dish upside down on the upper flower pot. In the bottom of the upper pot, not all holes are on the same level. Some holes are lower than the other ones. The lower holes are not blocked by the plastic dish laying on. These holes form the air openings needed to have the heads grow on the roots. These witlof heads grew on chicory roots in a dark space made of 2 flower pots and a dish. In the upper flower pot there is little room for the growing heads. The air in there is rather moist. This can result in more brown spots or brown leaves at the witloof heads. This dark area is cheap and easy to make. It is the best one. Below more info about this dark area. This construction has been made of 2 sheets of (black) cardboard. Size of each sheet is about 70 x 50 centimeters (2 ft 4 inch x 1 ft 8 inch). Eight paperclips ( 4 on top, 4 below) are used to keep the pieces of cardboards in a cylindrical shape. On each side there are clothespins fixed to the sheets to form an air opening. The cylinder is on the floor. Paperclips connect the 2 cardboard sheets. There are 4 paperclips at the bottom, 2 at each overlap. And there are 4 paperclips at the top of the cylinder. Closeup of one side. The clotespins form an opening. On this photo the 2 sheets are taken apart. The outer side of one piece of cardboard is visible. One clothespin has been put on the edge of the cardboard. Another pin has been put “cross” on the first pin. When the sheets are put together these clothespins form the air opening. You can put the clothespin on the inner edeg or on the outer edge of the cylinder. That makes no difference. As long as there is an air opening between the cardboard sheets. When two pieces of cardboard overlap too much, the length of 2 clothespins can be too short. The air opening in the cylinder is too narrow then. Advice: Use 3 pins and connect them as shown on the photo above. On the cylinder there is a kind of cardboard lid with edge. No light can get into the cylinder. The edge of this lid is downward. The side of the cylinder is pushed inwards when laying the lid on. This lid does not shift aside and the cylinder keeps its shape. This construction forms a robust dark area. This lid can be cut from a cardboard sheet. The lid is about 35 x 40 centimeters (14 x 16 inch). The edge is circa 4 centimeters (1.5 inch) high. Use staples to make the corners of the lid. Instead of making, perhaps you can buy these type of cardboard boxes. When needed you can put extra staples in the glued cardboard pads. Against getting loose. You can make and place this dark cylinder with both air openings away from the light. So towards the dark side of a cellar, cool barn or cool garage. This dark space has a big volume. The air in this space is rather dry. The witloof heads growing in it have no or only few brown spots or brown small leaves. Using 2 sheets of black cardboard and an extra piece of black cardboard, you can make a dark area where 2 flower pots fit in. You can cut (light brown) cardboard sheets from the lid or the bottom of a cardboard box. Bend the sheets in a cylindrical shape using paper clips and clothes pegs. This dark space works well too when growing witloof heads. Below there are photos of my first witloof forcing. At these roots, no short leaves have been taken away. All short leaves are present. Forcing was at a rather high temperature. This photo shows the chicory roots with small, thin heads. The heads grow from the inner small leaves. The heads have grown for 10 days in the dark at about 20 C (68F). Close up. On this photo you see that the small outer leaves dry and colour to brown. They are not used for growing heads. Below there are more photos of my first witloof forcing. At these roots, no short leaves have been taken away. All short leaves are present. Forcing was at a high temperature. These chicory heads are big enough to harvest. It has grown in the dark for 26 days at 20 C (68F). At these heads all short leaves were present. The heads are “loose”. The leaves of these heads are not tight together (as normally at “grocery witloof”). Close up. The short outer leaves have dried and turned to brown. And white leaves have brown stripes. You can harvest a head by breaking it off the root while the root is still in the compost. Or you take the root with head out of the compost. And break or cut the head from the root. Or you put a rubber band around the head. Then cut off the head about 1 inch above the root. The 3rd method is new. After harvesting you can grow new heads on the roots again. At some species this goes better than at other species of Chicory. More info further in this tip. All 3 procedures are described below. And you can read what procedure is easiest. Below there are also photos of my first witloof forcing. Fold the short leaves down at one side of the root, at the front side. Bend the chicory head to the front. Turn, bend and pull the head until it breaks off from the root. Meanwhile hold the root with the other hand. Harvest all witloof heads in this way. All (10) heads have been harvested. Roots with short brown leaves remain. The 10 harvested chicory heads. Total weight is 850 grams. Forcing was in September-October in my cellar. Temperature was about 22 C (72 F). That is too warm. The heads are “loose”. The leaves of the heads are not as tight together as at “grocery witloof”. Forcing between 15 and 20 C (59 to 68 F) is better. You need not to harvest all heads at the same time. You can keep some heads on the roots for later harvest. Below there are photos of my next witloof forcing. Carefully pull the root with head out of the compost. Break off or cut off the head from the root. When broken off, there can be a part of the root attached to the head. Use a knife to cut the part of the root off. You need not to harvest all heads at the same time. You can keep some roots with heads in the compost. Put compost in the flower pot to fill the empty space. Strew sand on the compost. Put the whole (on a dish) in a dark space until next harvest. Pour water on the dish when needed. Put an elastic band around the heads. The elastic band prevents the head from falling apart after cutting. The cut the head about 1 inch above the root. Store the witloof heads (leaves) with elastic band in a refrigerator when not used immediately. You need not to harvest all heads at the same time. You can keep some roots with heads in the compost until next harvest. But don’t wait too long for the next harvest. Some witloof leaves can “shift” (see the left head on the photo). This is due to the tension of the elastic band around the head. Hold the head with topside up and tap with the lower side on a cutting board to get the leaves good again. After a few hours the cutting surface of the witloof can get brownish. See photo above. Cut a thin slice before preparing the witloof. At some Chicory species, new heads can grow in the dark on the roots after cutting off the witloof heads. See chapter N)# New witloof heads on “used” chicory roots ? 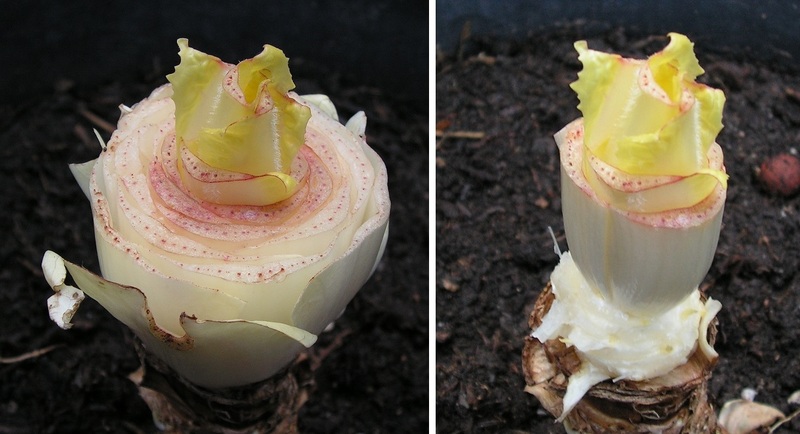 The photo’s above show that “taking out the root with head and then cutting off the witloof head” is the easiest method. But putting an elastic band around the head and cutting off above the root goes well too. After this harvest you can let new heads grow on the roots. Note: not at all Chicory species. See description in N)# New witloof heads on “used” chicory roots? The 10 heads on the photo above have grown “too warm”. Forcing was in September-October in my cellar. Temperature was about 22 C (72 F). That is too warm. The heads are “loose”. The leaves of the heads are not as tight together as at “grocery witloof”. And they can taste more bitter. Forcing between 15 and 20 C (59 to 68 F) is better. (the same photo as at L1). These witloof heads have grown at a temperature of 10 to 15 C (50 to 59 F). The heads are more compact. These heads have some light green leaves due to growing in light for some days. The heads on the 2 photos above have grown at about 12 C (54 F). Heads did not grow fast but heads are big and compact. The 4 heads on the photo weigh 810 grams in total. Growing witloof heads goes well between 15 and 20 C (59 to 68 F). After 6 to 8 weeks you have big compact witloof heads that do not taste (very) bitter. After harvesting, a flower pot with chicory roots remains. Can new witloof heads grow on these used roots again? After breaking off the witloof heads, a flower pot with chicory roots remains. These are also photos of my first witloof forcing. At some roots they are “kept as they were”, at some other roots all short leaves have been broken away and at other roots the top has been cut. Next step is pouring much water between the roots until the compost is soaking wet. When much water immediately flows out of the flower pot (through the holes in the bottom), the compost does not get soaking wet. You better immerse the flower pot with compost and roots in a big bucket filled with water. Take the flower pot out of the water after about 30 minutes. Wait about 24 hours to let water flow out of the flower pot. The flower pot with chicory roots can be put in the dark again. These heads have grown on the used roots, in the dark, for 38 days at 15 C (59 F). On many roots there are small heads. On some roots there are no or tiny heads. Photo of the harvest. Many small heads have grown on the roots. All heads have been “picked” and are on the left side on the photo above. Total weight is 250 grams. On the right side of the photo there is a “normal” head to compare the sizes. Yes, you can grow heads twice on the same roots when breaking off the witloof heads. But the second time, the heads grow slower and the heads are smaller. This is because the “heart” has been broken or cut away at the first harvest. Instead of breaking off, you can cut the witloof head a few centimeters (about 1 inch) above the root. At some species (e.g. Videna) you easily cut a piece of the root then. On such a root, no big witloof head can grow on. At other species (e.g. Oranjeband) you cut through the witloof leaves then. After cutting off the witloof leaves, the Chicory root looks the same as after cutting long green leaves the first time. On such a root, a big witloof head can grow again. See below. Put elastic bands around the heads. To prevent falling apart of the heads after cutting. Then cut off the heads about 1 inch above the roots. See photos above. You can cut off without an elastic band around the heads. Hold the witloof head in your hand during cutting to prevent falling apart. Carefully lay the cut witloof head (witloof leaves) in a tray. This harvest is 1150 grams. Chicory roots after cutting off the heads. On each root there are many short leaves. Remove the dish. Pour much cold water in the pot to moisten the compost. (note: on the right photo, the flower pot has turned a half turn). As an experiment short leaves have been broken away or cut shorter at some roots. In the flower pot there are now roots with many or few, short or long leaves. About 24 hours after pouring in water, a dish has been put under the pot. As a mark a white thing has been put through 2 holes in the pot. Then the whole has been placed in a dark space again. The right photo shows new witloof heads after 3 weeks of growing. The same heads after 7 weeks of forcing in the dark. Ready for harvesting. Again an elastic band around the heads before cutting off. To prevent falling apart of the heads. Some heads have been cut above the roots. All heads are tight. Only the 3 heads on the right photo are “loose” a little. All heads have been cut. Harvest 980 grams. So when you cut the heads about 1 inch above the roots, new heads can grow on the used roots again. That is not so weird. At the first forcing, heads grow on roots with short green leaves. Next forcings are on roots with short white leaves. Forcing may continue as long as the root has enough energy to grow witloof heads. There are no (or only a few) brown short leaves visible on the roots that had all short leaves before growing. So breaking away short leaves from the outside is not really necessary. You may break off some short outer leaves again. Then pour cold water in the compost. When the water flows out of the holes of the flower pot, the compost migh not get well soaking wet. Then submerge the whole in a big bucket with water for about 30 minutes. Take the flower pot out of the water and wait for about 24 hours to let water flow out of the pot. As a mark a blue rubber band has been attached to the white thing. The whole has been placed in a dark space again. The same chicory roots with witloof heads after 8 weeks of growing in the dark. The heads have been broken off, because this is the last harvest. Harvest is 670 grams. This experiment shows that you can harvest 3 witloof heads on the same chicory root. Each new harvest is “smaller”: 1150 grams, 970 grams, 670 grams. Some witloof heads of the 2nd or 3rd harvest can be some loose. Most of the time that is no problem. Removal of many outer short leaves works is a good action. Breaking off can be done later, when there is a small witloof head already. Below some photos of another flower pot with 9 witloof heads. These witloof heads don’t look healty. There are brown, sticky, short outer leaves. On the heads you see spots. Here the witloof heads have been broken off. The short outer leaves on the roots are brown, moist and sticky. Some broken off witloof heads have brown sticky short leaves. On the heads you see spots. Those spots are aphids. Easily to remove with a washing-up brush under running tap water. But still a problem. 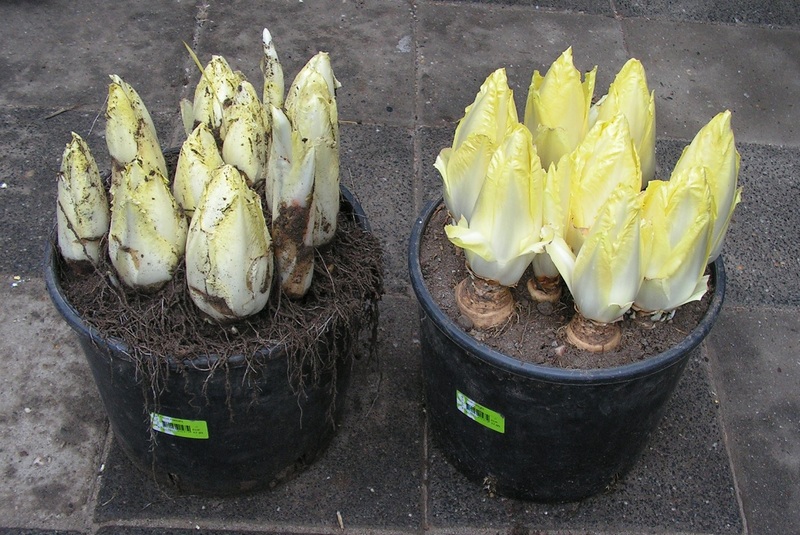 The same chicory roots before forcing witloof (left side photo) and after breaking off the witloof heads (right side photo). it can happen that grown witloof heads don’t look “very healty”. Short leaves can be brown and moist. 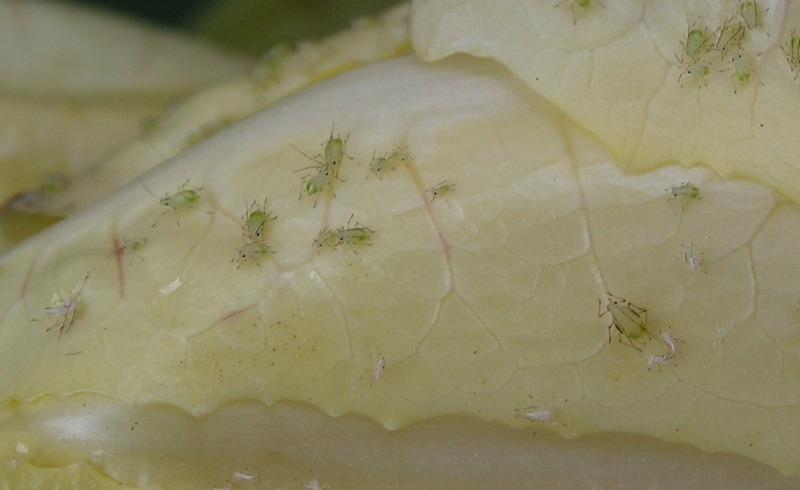 There can be aphids on the leaves of ht witloof. Removing outer short leaves is a wise action before each witloof forcing. In an experiment, short white leaves have been cut “rectangular”. On these roots good witloof heads grow too, as shown on the photo above. break off many outer leaves of each root. cut rectangular many short leaves at each root. Both procedures end up with good, normal witloof heads growing on the roots. At some Chicory roots in the left side flower pot (species Videna) the root has been cut during first cutting off harvest. There is no big witloof head now, only many small ones. At all Chicory roots in the right flower pot (species Oranjeband) the leaves have cut during the first harvest. The root has not been cut. A big witloof head has grown on each root. Sometimes there are one or more bad chicory roots in a flower pot. See the photo above, at the left side. Such a root and head often stink. The head is “loose” on the root. You can easy check the root by pushing gently against the side of a head. Remove this bad root and fill the hole with compost. A photo of a bad root cut into 2 pieces. The head is “loose” and the root has a brown coloured inside. Sometimes your own grown chicory tastes more bitter than expected. The bitter taste is concentrated in the “core” of the chicory head, the lower part of the head. You can cut away this part of the head. Or add milk at the cooking water. Chicory heads grown at higher temperature, 64 to 68 F (18 to 20 C) taste more bitter than grown at lower temperature, 50 to 59 F (ca 10 – 15 C). You can fill a flower pot with garden earth instaed of compost. And put chicory roots in it. These witloof heads have grown “in compost” (left flower pot) or “in garden earth” (right pot). Garden earth in a flower pot also gives good forcing results. But garden earth will dry out faster than compost during forcing. So you have to add water to the garden earth more often. When filling with compost, normally there is less need for watering during forcing. Important: do not water too much during forcing. The dryer the better. And put the roots far apart in the compost. Otherwise risk of rotten or brown leaves on the heads. On this photo you see that heads even grow on small chicory roots. The grew for 8 weeks at 15 C (59 F). Much slower than “normal” heads. They did not grow in pitch dark. 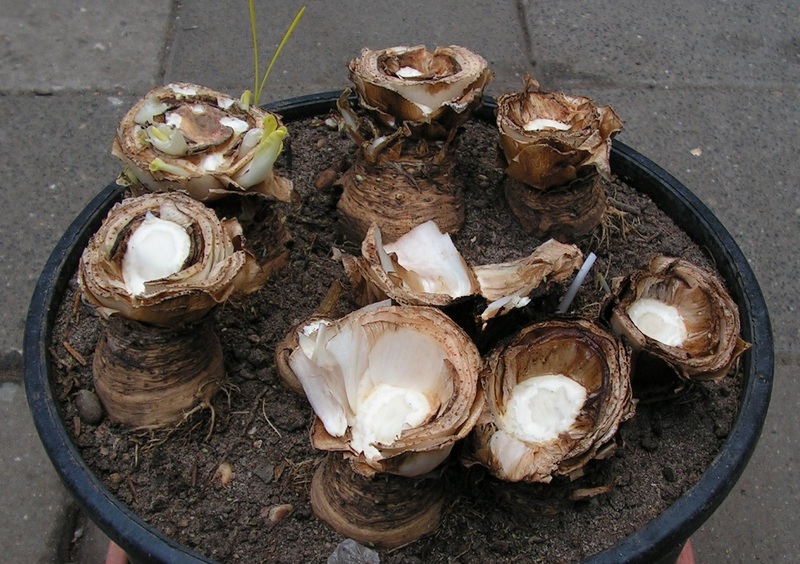 You can grow good witloof heads in a small flower pot with few chicory roots. Chicory plants in your garden soil can withstand frosty nights. But they do suffer from severe frost. So harvest the plants not too late. Put the roots in flower pots with compost. Store the flower pot with roots dark and cool. This is a very easy and useful method. Lay roots between moist paper in a tray with plastic foil over the tray. Store the tray in a cold room or in a refrigerator. After storage, put the roots in a flower pot with compost. This method requires much more work. S1a) Put roots in a flower pot with compost and store cold. Execute all actions as described at E)# to I)#. So cutting leaves and roots, remove some outer leaves, put in flower pot with compost, add water and put in a dark area. Put the whole (flower pot with roots in a dark area) on a cold, frost-proof room. For example outside under a roof or under a garden table so it is stored in a dry place. At severe frost, put the whole in a frost-proof room (shed or barn). Or cover the whole under the roof or the table with a blanket or a sail cloth. At non freezing weather, put the whole back on its original place outside or remove the blanket or sail cloth. In this way, roots are in a cold dark area and heads will grow very slowly. When you want to grow heads, put the flower pot with roots in a dark room at about 15 to 20 C (59 to 68 F). 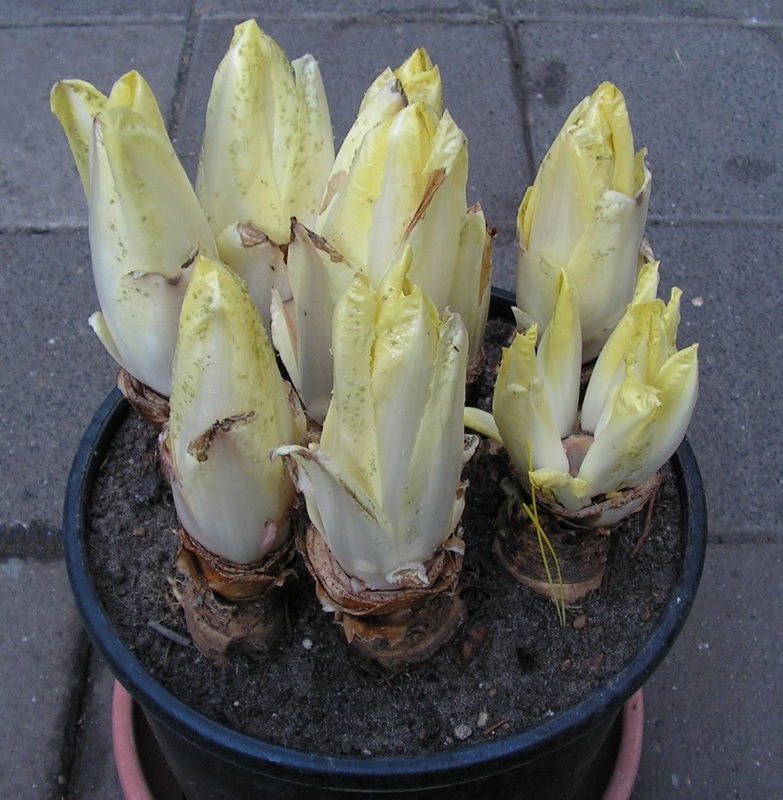 These Chicory roots were stored in a flower pot at a dark, cold area. These Chicory roots were stored for 17 days, outside under a roof, at 1 to 7 C (34 to 45 F). On the leftside pot there was another flower pot (upside down) and dish. The right side pot was in a cardboard dark place. Some outer leaves were brown. Some “inner leaves” are brown or black. The inner leaves have grown a little and have turned to green. Only from one root (the root at the back on the photo above), black small leaves have been removed. Some outer leaves are brown. Most inner leaves have grown and turned into light green. After this storage, each pot with Chicory roots has been put in the “original” dark area in a room at about 15 C (59 F) to grow heads on as described at I)#. I only made a photo of the witloof heads grown in this dark area: an “upside down flower pot with dish on”. There are no or little leaves with brown spots. On the other roots (in a black cardboard area), good witloof heads have grown too. This storage requires more work. Cut foliage and a part of the roots as described at E)# and F)#. Wash the roots with short leaves in a bucket filled with cold tap water. Remove some short leaves, starting from the outher side as described at G)#. Break off many or few leaves. On all roots good, normal witloof heads will grow. Wash the roots with short leaves (2nd time) in a bucket filled with fresh cold tap water. Lay washed roots in a tray between moist kitchen paper. Put plastic foil over the tray. With a narrow air opening. Put the whole in a refrigerator or in a cold room, for example outside under a roof or under a plastic garden table. At severe frost put the whole in a frost-proof room. Regularly check if kitchen paper is moist. That can easily be done through the air opening. When (too) dry, remove plastic, spray water on and put on plastic again. These roots have been stored in a refrigerator for 7 days and then outside under a roof between 1 and 7 C (34 and 45 F) for 15 days. Some roots have brown outer leaves. Inner leaves have grown and coloured to light green. These roots have been stored under a roof outside at a temperature between 1 and 7 C (34 and 45 F) for 17 days. Some roots have brown “inner leaves”. At all roots, shorten the leaves. Use a sharp knife and a wooden board. Put the roots in flower pots with compost and add much water as described at H)#. After 24 hours, dry sand has been put on the compost layer. Then each flower pot has been put in a dark place (cardboard dark area) as described at I)#. These heads have grown in 46 days between 15 and 18 C (59 and 64 F). The big heads have been harvested, more than 1 kilogram. The small heads grow further in the dark area. Both storage methods give good witloof heads. Cold storage in flower pots with compost is much easier than washing and cold storing in moist paper. Herman, a Canadian gardner, wrote a comment on this post. And he sent me this photo by mail. I replied his comment as you can read below. A chicory root kan have a crack. Or a root can look like this. At these roots break off many small leaves. Then clean the root and the leaves with a soft brush under running tap water. On both roots, good witloof heads have grown. You can take the last chicory plants out of the garden soil in the beginning of the winter. Dig them out at non freezing weather. These chicory plants have been digged up early winter (December 26). Many plants have some brown leaves due to freezing. After cutting the foliage and breaking off some small leaves, the roots look normal. On these roots, good, big witloof heads have grown. Sorry no photo made. Last chicory plants have been digged out in “half mid winter” (January 16). These roots are thinner and (some) shorter than normal. They have been put deeper in the compost than normal. So the roots can absorb water during forcing. The flower pot with roots has been stored cold for 1 week. Outside, under a roof. Inner short leaves have grown a little and turned to green. The same roots with normal size witloof heads grown on. During forcing, no water has been added. Chicory plants can withstand some freezing weather. Take the plants out of the soil at non freezing weather. On rather short chicory roots that have been put “deep” in compost, good heads grow. Do not add water during forcing. Watering can cause rotten witloof heads or brown leaves on the heads. You can force witloof heads while there is earth above the Chicory roots. That goes well in a flower pot. Below some photos of my witloof forced that way. Needed: Flower pot with Chicory roots in moist compost, a loose flower pot cylinder (cut from a flower pot) and a bucket fulll of garden sand or garden earth. Put the flower pot cylinder on the compost in the flower pot. Put dry garden sand (garden earth) on the Chicory roots. Lay a clothespin on top of the sand and put a dish on the flower pot cylinder. This forms an air opening. Put a brick on the dish to prevent the pot cylinder from moving up during forcing (and dry sand will “flow away”). Harvest: use pincers to remove the pot cylinder (the cylinder can get stuck during forcing, so pincers needed). Remove the garden earth between the witloof heads. Witloof heads with earth coverage (left side) and without earth coverage (right side). Both forcings have been started at the same date. The witloof heads grown with earth coverage are very “compact” and “steady”. There is garden earth on and between the outer leaves of the heads. Some witlof leaves show brown edges or spots. The witloof heads grown “in the free air” are a little loose. And very clean. During forcing there was no weight on top; not needed. During harvest the sand has been collected in a bog carboard box. The root ball has been taken out of the flower pot. So the witloof heads can be broken off. This entry was posted in chicory, witloof. Bookmark the permalink. Incredible, I had no idea the work involved to grow witlof. I planted 4 plants and assumed they just grow in the garden and turn into witlof all by them self. This veggie should be $15 dollars a pound for all the work that goes into it. But Thanks for a great article. It sure was very educational. Yes, growing witlof is a challenge. I’ve tried many years to grow them, but only last years (from 2012 on) I succeed to have many well tasting normal size witlof heads. A very interesting article. I have had more years with little or no success than good ones. Mostly I have always totally covered them and planted them outside against a warm house wall. This year I already placed some roots in the manner you have just illustrated. We will see. I may not have given them enough water. In my Dutch Version (Sjeftuintups) I have more info and photos about this. I will soon add them to the english version. After putting the roots in the flower pot, add very much water. The roots must stand in a “mud” of compost and water. Then not water anymore for some weeks. Only add some water when the compost feels very dry. Hi Sjef! Great article. Thank you very much for the detailed illustration. I will give a go at growing them this summer. Thanks for your comment. When you follow my description, I think you will succeed in growing “witlof” too. Fantastically illustrated and most informative. Thank you. That’s why I started Sjefgardentips. To share gardening tips and successful methods with many people. Yes, I agree that it is much work to grow witloof. First in garden soil and then in a flower pot. But it is worth trying. Growing witloof is more waiting than working. Work is: sowing, thinning, plants out, cutting leafs and roots, in a flower pot, in a dark place. In Holland, “hydroculture” witloof costs only about € 1,60 per kilogram. These heads have grown while roots are in a water bath with nutrients. Most people buy these. Soil-grown chicory costs about 5 to 10 euro per kg. These heads grew with roots in soil. Concerning the price you pay, it can be profitable to try it. When you follow the described steps, you will succeed in growing much witloof. I just came across your article as I’m not happy with my results. Here is a picture of what the situation looks like now. (From Sjef: the picture is to be seen at chapter T)# of this post). I have put your witloof photo at chapter T)# of this post. As you mentioned in your mail, you can follow the advice of the Dutch gardner. Have the witloof heads grow some longer in your bucket until they are big enough. 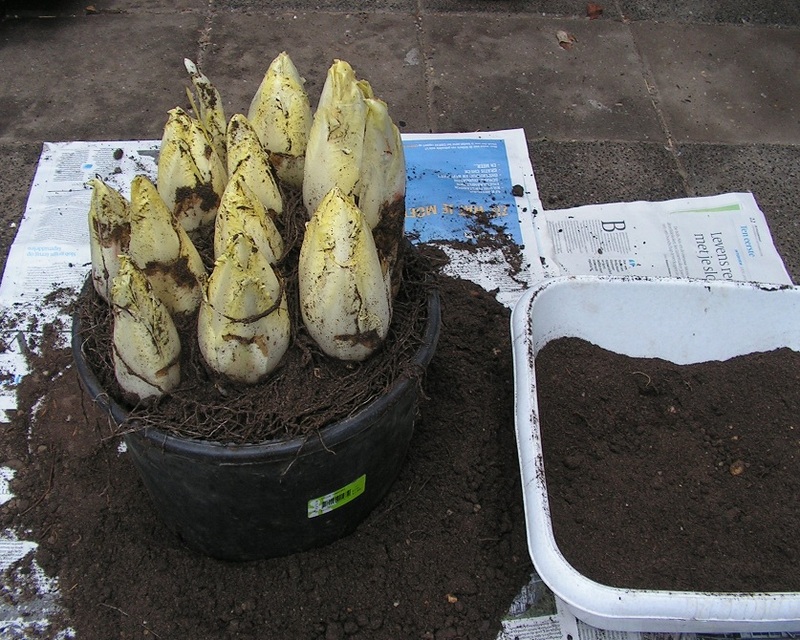 But when you have some more chicory roots left, you can grow heads following the “Sjef way”. Or you can take a few roots (with small heads) out of your bucket, put them in a flower pot with compost and then follow the “Sjef way”. Impressive explanation! Other websites refer to a period of storage of the harvested roots, such as 4 weeks at 14 degrees Celcius, before planting in containers and the dark. How long is your recommended storage period and at what temp? In early autumn, I harvest the first chicory plants. When dry weather is forcasted, I lay the digged out plants on the garden soil [see chapter D)#]. They stay there for about 5 to 10 days. Under the weather conditions of that period; temperature between about 5 and 15 C or so. At a rainy weather forecast, I lay the plants outside under a roof for 5 to 10 days, so at the same temperatures. The digged out plants should not get wet anymore. This can cause rotting of leaves while laying on the soil or on my pavement. After this waiting period, foliage is cut, roots are cut etcetera. From mid autumn on, I do not store the plants anymore on that way. Right after digging out, foliage is cut, roots are cut and roots are put in the flower pot with compost in it. Hi, I’m just starting to attempt cultivating witloof now (Oct 2017) here in Ireland & have discovered your magnificent research which I will be following religiously. Congratulations on your amazing piece of work – Nobel prizes have been awarded for less. Can you please advise how to store roots in the period between harvesting and starting to grow heads in case I do not want to cultivate heads instantly after root harvesting? Shall I cut leaves off just after harvesting and store them without leaves? In chapter S)# of this tip (Storing chicory roots), there is described how to store the roots during that period. Best storage is to cut the foliage and put the roots in compost in a flower pot. Store the pot with roots in the dark at a dry, cold, non freezing place (temp 0 to 10 C, 32 – 50 F). Thank you for your reply. I appreciate a lot. So I will prepare roots and put them in flower pot and place them in some non freezing place. Since here is still relatively warm weather (15-18 C day, 8-10 C night) I will wait a little for taking out roots from garden bed till temperature starts to approach freezing point during night. Hopefully I will have some good roots. Only 8 plants left, the rest was damaged by water vole ( I should think how to protect them next time) and 1 plant prematurely came to flowering (due to very hot and dry summer weather). Yes that’s a good decision. I would like to know where I can order chicory roots to start my Belgian garden/crop at home. Please let me know. Thank you. Hopefully some visitors of Sjefgardentips, who know where to order chicory roots, react on your comment (via “reply”). My name is Bob and I would like to start my Belgian endive garden. I know that this is cold weather vegetable but we have mild winter here. 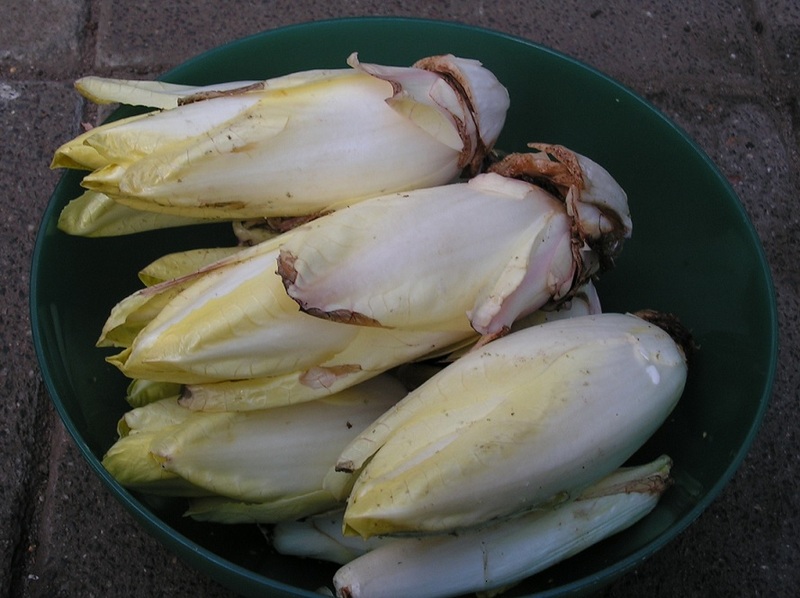 Where can I buy chicory roots that will produce Belgian endives and roots for producing witloof heads? Thank you for this excellent researched planting method. Hi Bob, thank you and no thanks. I think that witloof heads and Belgian endive (heads) are the same veggie. So growing on the same roots. It is rather hard to get the witloof roots, so I grow them myself. comments of “talkingalwayz” at this youtube video ( https://www.youtube.com/watch?v=VpHnbWFmvQo ) .